Old Age or Faulty Installation Can Create a Need for Shingle Roof Replacement. Asphalt shingles represent the most popular roofing solution in the country. This makes sense when you consider their value and wide range of available colors and styles. Unfortunately, asphalt shingles sit at the bottom of the ladder in terms of longevity. Even with expert maintenance, a shingle roof will only last for 20 years or so. Pay attention for the following signs of shingle roof replacement, and choose a higher quality option in metal from Affordable Gutters Plus LLC. A roof that has begun to require frequent repairs has probably reached the end of its life. Whether from old age or faulty installation, roofs will begin to break down and require more and more service. Whether it’s from missing shingles or leaks, roof repairs can become surprisingly costly. If you find yourself with a major repair that represents a significant percentage of the cost of a new roof, go with the fresh installation. Your roofing’s granules protect it from impacts and the sun. 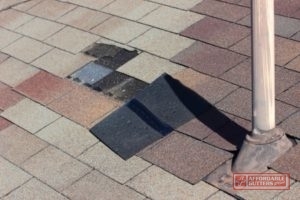 In their absence, your roof becomes much more vulnerable to storms and hail. Your shingles will also dry and begin to curl from sun exposure. Each of these provides for the development of leaks, a situation you want to avoid. The next time you clean your gutters, call for service if you notice an abundance of roofing granules. The most frequent reason for replacement, old age means that a roof could fail at any given time. Even if damage doesn’t seem obvious to the untrained eye, previous bouts of hail and high winds have definitely left their mark. If you’d like to replace your shingle roof with a quality metal installation, Affordable Gutters Plus LLC is your ideal choice in Canton and Roswell, GA. To learn more or schedule service, give us a call today at 770-735-4433. Posted in Uncategorized on March 22, 2018 at 4:14 pm by Affordable Gutters Plus LLC.